"Image quality is about more than megapixels"
Fujifilm isn't too worried about the emergence of 8-megapixel CMOS sensors for mobile phones. "I don't think that we, or the rest of the digital camera industry, are too worried about high megapixel counts in mobile phones," Theo Georghiades, product manager for digital cameras at Fujifilm, told Tech.co.uk today. "Even if the megapixel count is high, mobile phone cameras still suffer from slow image processing, high shutter lag between photos, and poor zoom. Cameraphones will most likely get even higher megapixel counts, but they will never be able to cram in the same lens technology as digital cameras feature. 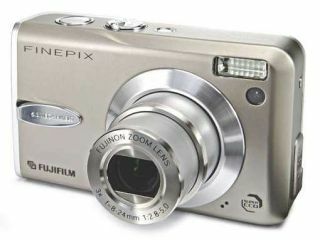 "If anything, I think mobile phones with high megapixel counts could mean more sales for digital camera manufacturers. As people get more used to taking photos, many will upgrade to a camera offering more quality shots," Georghiades added. Mark Robinson, Lumix product manager at Panasonic, agreed: "Providing still image capability for mobile phones is very much a value-added feature," he said. "Mobile phones and digital still cameras continue to cater for different markets. The quality of the functions and capabilities for which the product is primarily intended remain the key selling points for consumers."